Cabbage Mealy Aphid as the name suggests affects brassicas, including swedes and radish. This pest is present through­out the year with the heaviest infestations peaking in early autumn. During the cooler months, aphids mate and produce eggs which overwinter on leaves and stems. Control this by removing plants and plant debris after cropping, this will help to reduce over wintering populations of eggs and adults. Some adults may survive mild winters. The symptoms appear as yellow patches on the foliage, especially in early summer. This is caused by colonies of grey-green aphids that are covered in a white powdery mealy wax. The aphids usually congregate on the undersides of the older foliage, and as the weather warms up the aphids can give birth to as many as five live young a day. Then the young aphids tend to feed on the younger leaves on the growing tip. 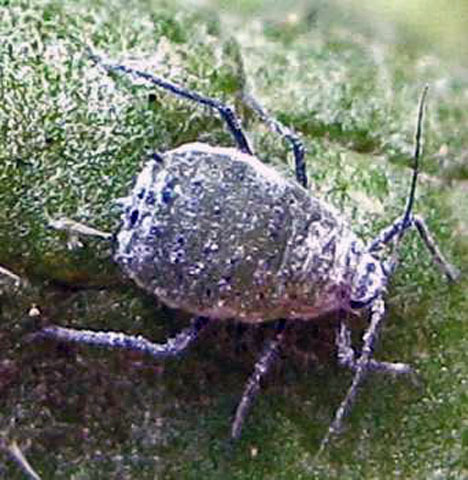 The aphids can damage plants in two ways, either directly by piercing the leaf with their feeding tubes and sucking the sap, or indirectly by infecting the plant with a virus. They can also transmit cauliflower and turnip mosaic viruses which often manifests itself in the form of stunted and or deformed plants. Heavy infestations can kill the growing tips of young plants, this in effect ‘stops’ the plant resulting in the formation of side shoots and subsequently multi-headed plants. There may also be a covering of a sticky, sugary substance on the leaves which often becomes infected with sooty mould. Because these plants are grown for the table, great care should be taken when using chemical controls, plus always follow the instructions on the packaging / label. Synthetic insecticides containing bifenthrin give good control but can only be used once, whereas organic insecticides containing pyrethrum, rotenone, fatty acids or vegetable oils can be used more often. Avoid using a broad spectrum of insecticides as these will kill beneficial insects as well as aphids. The best treatment is prevention and this is achieved by being vigilance, in the form of checking the plants on a regular basis. If the pest is observed spray the infestation with a jet of clean water, or spray with a natural fatty acid,e.g. insecticidal soap. The use of horticultural fleece can stop the aphids spreading. Encourage aphid predators such as ladybirds, hoverflies, lacewing larvae by planting suitable flowering plants nearby. One can also use parasitic midges called aphidoletes.